Chrissy Metz as Kate for This Is Us. 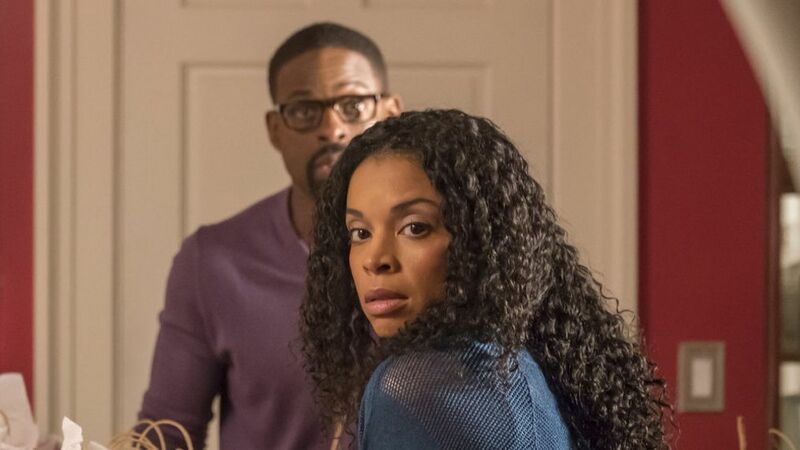 This Is Us may be over for the season but that doesn't mean fans have to take a break from the show's wonderfully talented stars. Among the exemplary cast is Chrissy Metz, whose portrayal of Kate Pearson has captivated audiences, as she contributes to some of the show's most emotional moments—and boy are there are a lot of them in this NBC series. After two seasons and two consecutive Golden Globe nominations, Metz is finally giving fans a more in-depth look at the experiences that have shaped her journey in her new memoir, This Is Me. TV Insider spoke with Metz about candid book, This Is Us' third season, and more. How did This Is Us influence your decision to write This Is Me? I had so many stories—as we all do—of tragedies and triumph, and when some people approached me about writing a book, I was like, ‘I don’t know, is it too soon?’ and they assured me it wasn’t. People want to hear what you have to say, but you can’t sit down with 30,000 people and actually tell your story, even though I’d love to because I love people. So I thought, 'OK cool, people will know me as Chrissy and not just Kate'—even though, of course, they both inform each other. Which This Is Us character do you think would benefit the most from reading This Is Me? Besides Kate, of course. [Laughs] God, that is… is so presumptuous. I don’t know, you stumped me! I think anybody can benefit... I can’t even believe people are spending their hard-earned money to read it. I think that’s amazing and so beautiful. Chrissy Metz as Kate, Justin Hartley as Kevin in This Is Us. I think maybe it's more so public speaking or telling stories or telling jokes, I love doing that. I’m sort of all over the place and not so good at actually putting things in proper order, so that’s why I need [editors'] help with that. Would you ever consider working with the writers on an episode of This Is Us? Oh my god, I would love to! I feel like I have so much to learn [Laughs]. It’s very difficult but probably a little easier because we know the voices of the characters now in our show–obviously better than we did in the beginning. But you have to consider past, present, and future and then you have to write for commercial breaks. It would be such an amazing challenge and what an accomplishment if I could do that, it’s definitely something that I want to do. What was your schedule like, having to juggle working on this book and the show? I did it while we were shooting Season 2. It was definitely a challenge and everybody was so gracious with their patience and their time. It was definitely right in the thick of awards season and I was editing during Christmas. One of your first chapters references a celebrity encounter where you were starstruck. How do you feel when people react in such a way to you? It’s weird because I feel like I haven’t changed but everything around me has changed. The fact that people even know my first and last name still surprises me. And then if it’s somebody who I revere, be it Sam Rockwell or Alfred Molina—who came up to me at the Golden Globes and said they were fans of my work—I’m like, ‘What? Who are you talking to? !’ Honestly, it still gets me, it baffles me. Justin Hartley as Kevin, Chrissy Metz as Kate, Sterling K. Brown as Randall in This Is Us. Positivity is a major theme in your book. Do you think This Is Us also has that, even if it makes fans cry? Yeah, I do! I think we’ve got to talk about our feelings so we can understand them, and then decide what to do with them. It’s not about what happens to you, but how we react to it. And I think when you can figure that out, and you come together with people that you love, be that family, friends or a significant other, it’s really empowering. We all want the same things and need each other, so if you can do that with love and kindness and positivity as our show does, I think it impacts people. That’s why it’s no coincidence that every single person on that cast was cast, that the show is doing what it’s doing, because it was all meant to be. It’s just lightning in a bottle, magic. Every single person had to work their butts off and it didn’t happen overnight and they remained positive. What’s one lesson that you hope fans take away from this book? You’re enough just as you are, you don’t have to do anything special or extra. We’re all going through this journey, doing the best we can, but if someone doesn’t want to date you anymore or cuts you off on the road, it doesn’t have anything to do with you. I think, sometimes, we take things so personally and then it stifles our growth or it really paralyzes us moving forward. Reading this book, fans will learn that you have more in common with Kate than they may have previously thought. What past experiences have helped you most in the role? I didn’t have a loving relationship with a father figure as Kate does, so I really can’t relate to that, but I always hope and wish that I had that, and that’s what I use in that journey. Obviously, we’re both aspiring singers and love music. I’ve lived in a shadow of many people, because I’ve been too afraid to step into the light and take the big leap. While we’re very much alike, we’re also very different. I think Kate is who I used to feel like when I was much younger, but I’ve come through a lot of that on the other side. Not perfect–definitely a work in progress—but I think the music, being the second fiddle, and taking the route with many detours, in that way, we have a lot in common. Chrissy Metz as Kate, Chris Sullivan as Toby in This Is Us. After the book tour, I’m starring in a movie from Fox 2000 called The Impossible, so that is super exciting. It’s a role—not based on weight, and not even surrounding weight—about this really beautiful true story of a woman’s adoptive son who falls through the ice. H is pronounced dead but comes back to life through the collective consciousness of love and family. I have been teetering around with the idea of making one of the chapters in the book into a pseudo autobiographical coming-of-age story. And I want to do music when I can find time. What can fans expect to see in Season 3 of This Is Us? Kate and Toby (Chris Sullivan) are looking forward to trying to have a family together and it might not be in the most conventional way. I’m really looking forward to that because, as the writers and [showrunner] Dan [Fogelman] have shown in the past two seasons, every time you think they’re taking you one way, I’m always thrown for a loop. So it’s definitely going to be unconventional in the approach but also really figuring out what Toby’s depression is all about.